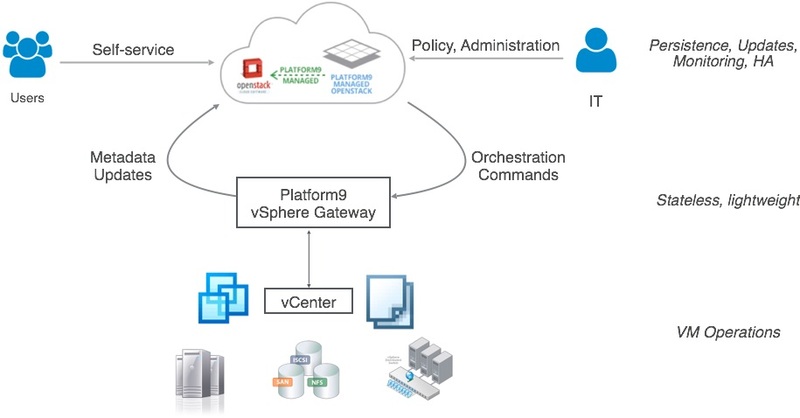 At Platform9, we recently announced General Availability for support of VMware vSphere, including 100% interoperability with existing vSphere infrastructure and management tools to make Platform9 the best cloud management solution for vSphere. I highlighted the benefits of this solution in an earlier blog post and indicated that we would be providing more technical details in the future. In another previous blog post, Platform9 lead engineer for VMware integration, Amrish Kapoor, walked through some of the shortcomings in the current vSphere support within OpenStack and proposed some capabilities that Platform9 believes are needed to garner greater adoption of OpenStack among the current VMware install base. As Amrish wrote, vSphere is still the gold standard for hypervisors and a large number of businesses rely on it to run their IT infrastructure. We believe that by delivering capabilities, such as dynamic discovery of existing workloads, enables Platform9 Managed OpenStack to be the ideal cloud management platform for running both legacy enterprise as well as new cloud-native workloads. If you are interested in learning more, I explain how we are able to integrate with vSphere and are filling gaps found in a typical OpenStack with vSphere deployment. You can read the entire blog post here. Below, you can also watch Platform9 co-founder and VP of Product, Madhura Maskasky, present on this topic during the recent Tech Field Day Extra at VMworld.